The Lachine Canal, the Atlantic Ocean's once upon a time chief entry to the North American continent is of major historical significance. It's also a Montreal treasure to locals and a fairly popular tourist attraction ever since its restoration and reopening to pleasure boating in 2002 breathed new life into the 14.5 kilometers (9 miles) that make up this Canadian National Historic Site. So how do you make the most of your time by the canal? Listed as the third most beautiful urban circuit in the world by Time magazine in 2009, a round trip of the Lachine Canal's bike paths covers 29 kilometers (18 miles) of terrain. And the scenery is gorgeous, green and rife with historical landmarks, ghosts of Canada's industrial revolution. But you might want to skip out on renting a Bixi bike if you're unfamiliar with Montreal and don't want to incur any extra charges. Most Montreal bike rental shops offer competitive prices and flexible rental options. Now, this particular attraction is admittedly off the beaten path, on the far west end of the canal. Unless you're a local who lives in the area, you'll probably end up here by bike. The Fur Trade Museum is one of the more entertaining ways to learn about the history behind the Lachine Canal. Expect a visit to take about one hour, maybe more. Exhibits are kid-friendly too. 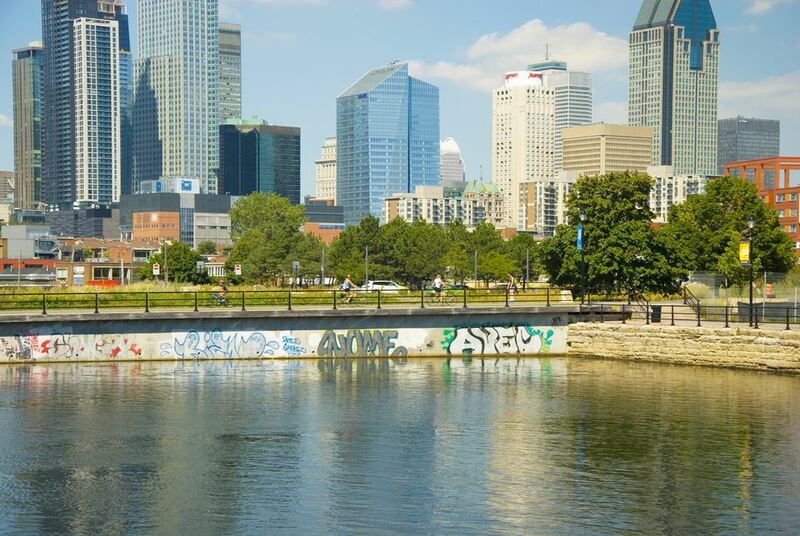 You could spend the entire day walking to and fro along the Lachine Canal's green banks. However, tourists seem to love meandering the 4-kilometer (2.5-mile) stretch from Old Montreal to the Atwater Market, taking in sights of the Old Port, the remnants of Griffintown and finally, discovering one of Montreal's favorite public markets, the Atwater Market. Situated a short stroll from the canal path, the Atwater Market is the most expensive public market in Montreal and perhaps the one best known by tourists, an ideal spot to purchase a few picnic items to enjoy by the water. Just be prepared to go over budget. And do drop by Fromagerie Atwater while you're there. This institution of a cheese shop has over 750 international and local varieties to choose from and they'll even let you taste a few before buying. As of February 2016, count on having access to six kilometers of cross-country trails also suitable for snowshoeing from Avenue Dollard in Lasalle all the way to Complexe Gadbois in St. Henri. Located right by the Côte-Saint-Paul lock along the Lachine Canal, even beer haters will have a soft spot for the Montreal microbrewery's apricot brew. With any luck, their terrasse might even have some raspberry ale and cider on tap. Snack foods are affordable too. It also boasts one of the best patios in Montreal come summer. Or canoe it. The Lachine Canal is open to pleasure boating, after all.